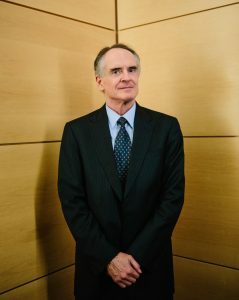 For quite a while now, I’ve been advising friends on the Right by suggesting they ask themselves a simple question: “What would Jared Taylor do?” Aside from the solid work he has done for our cause for close to thirty years now, you will be hard-pressed to find anyone who has anything bad to say about Jared. When it comes to leadership, character is the be-all and end-all. Jared has plenty of it, while others on the Right who proclaim themselves “leaders” (something Jared has never done) often seem to have very little. I believe there must be people on the Right who don’t like Jared on a personal level, but I believe this sort of in the same way I believe there’s probably a Bigfoot. Yes, I am aware that some criticize his strategies, the focus of his efforts, and his unwillingness to address certain questions. But I’ve never met anyone who had anything bad to say about him as a man. That’s really my focus here. But before I say more about Jared’s sterling character, and why he is a model of leadership, let’s just briefly review the man’s achievements. Jared’s Website and print journal are a goldmine of information and analysis, primarily focused on what he calls “race realism.” (The journal ceased publication some years ago, but its essays are available on the Website.) The articles, by Jared and others, are of the highest intellectual caliber, and are uniformly “fact based”: i.e., claims are backed up with evidence, some of it from the hard sciences. As a result, his critics on the Left (who routinely smear him as a “white supremacist”) describe him as making appeals to discredited “pseudo-science.” This basically means that he appeals to scientific fact that they would like to wish out of existence since it discredits their ideology. Jared has also written and edited several books. In recent years, he has been producing YouTube videos, which are models of cogent argument and persuasive rhetoric. In terms of his output, Jared is very obviously an example to us all. Again, however, it’s his character I want to focus on here. Why is he so respected on the Right? I met Jared for the first time in, I believe, 2001. My first impression of him was that he was an old-fashioned Southern gentleman with a layer of Ivy League polish – he received his BA from Yale. But there is no pretension about him: he lacks, thankfully, the insufferable toffee-nosed quality sported by Yalies like the odious Bill Buckley. In fact, there is nothing false about Jared Taylor at all; no sign that he is concerned with impressing others and projecting an “image.” He lacks vanity – or at least shows no real signs of being vain. In fact, I believe that one of his most important qualities – and a significant reason for the respect he has earned – is his selflessness. Now, Jared would balk at this – indeed, this entire article and its praise are likely to embarrass him tremendously. But that is just evidence of the selflessness to which I am referring. Jared is entirely devoted to the cause of saving his race, through educating the public about racial differences, and about the Left’s campaign to malign, dispossess, and destroy whites. Jared certainly does seek attention – through his conferences, his writings, his videos, and the many interviews he has granted. But he does not seek attention for himself – only for the cause he believes in. When Jared seeks and receives attention, there is no confusion in our minds as to his motives. Jared’s commitment is to truth, not to appearances. He lives modestly, in the suburbs of northern Virginia. One imagines that Jared has vices. But they are probably things like passing the port the wrong way, or taking two lumps of sugar in his tea. Speaking ill of others is certainly not one of Jared’s vices. He has managed to avoid this for most of his career on the Right. When attacked, he often prefers to maintain a dignified silence rather than stoop to the level of his attackers. Though Jared is no doormat – as his recent lawsuit against Twitter demonstrates. Jared does not posture. For example, he does not assert that he is a leader, he simply leads – by example. He does not – and did not – even aspire to lead anything. But he leads nonetheless, in virtue of his achievements and his unimpeachable character. Jared is the best example I know personally of a natural leader. He serves as an excellent illustration of one of Julius Evola’s basic principles: that power accrues to the man who does not seek power; who builds a stable center within himself that cannot be corrupted by desire, attention, or flattery. (In Jared’s case, his power is influence.) Jared is a strong personality, and such men often attract the weak and the needy, or at least the directionless. But Jared would never enjoy, let alone seek, the company of sycophants. One has the feeling that Jared (a philosophy major at Yale) has often revisited Aristotle’s description of the “great-souled man” in the Nicomachean Ethics. We respect and admire Jared because he does not seem to need our respect and admiration. And we admire him, again, for the purity of his motives; his selfless devotion to our cause. That devotion has cost him a great deal over the years, and he has had to make many sacrifices. He has been the target of hatred and smears from the unhinged Left. He has lost money (his involvement with the Right has cost him other sources of income). At least he is blessed with a loving (and long-suffering) family. Yes, of course, it’s true that Jared’s publications and his conferences don’t deal with all the issues that interest us. He is focused on certain matters, and not others. He believes that there is, and should be, a division of labor on the Right. He does not aspire to position himself as supreme leader of our fragmented movement, nor does he aspire to turn AmRen into the dominant organization on the Right. Jared is pleased when other like-minded folks do good work, and when they receive attention for it. He does not envy the successes of others, or feel malice towards those who find themselves momentarily in the spotlight. Now, please don’t misunderstand me: I am not nominating Jared as “The Leader.” I do not believe that at this stage, our movement can have a supreme leader – and I do not believe it needs one. Right now, the movement – as I have said – is fragmented. But that is not such a bad thing. It’s a movement of many voices, some of them extremely talented. It’s a movement of many individuals in many countries, affiliated (or not affiliated) with different organizations, producing all sorts of different product: Websites, books, videos, conferences, and so on. And, let’s face it, some of “us” are LARPers and trolls. We also disagree about many things – some of us, for example, are Christians, and others radically anti-Christian. Ours is a young movement, and this “diversity” (if you’ll pardon the expression) is a good thing. We are not at the stage where we can or should be “united” in any organizational sense. This may occur later on – or we may simply stay this way, hitting the enemy on multiple fronts, with multiple voices, never providing the enemy with One Big Target to go after (which is one of the inherent problems with the aspiration to “unite the Right”). No, I’m not offering Jared Taylor as “my leader.” I am merely offering him as a model for others – a man whose character and record are worthy of emulation by all who aspire to lead, in whatever sense. We need many leaders: leaders who inspire others with their hard work, selflessness, stability, and good sense. Three cheers for Jared Taylor – an example to us all! Published: March 12, 2018 | This entry was posted in North American New Right and tagged alpha males, American Renaissance, articles, Jef Costello, leadership, North American New Right, originals. Both comments and trackbacks are currently closed. Jared cares very deeply for white people. He is the embodiment of Savitri Devi’s man of “absolute selflessness.” He does not get emotional often, but I did see a glimpse of it at the conference a couple of years ago. This movement is about caring for your own people, and having courage. When Jared started to tear up at the end of that speech, I couldnt help but knot-up myself. The man is an inspiration and a beacon within our cause. Ive been thinking a lot lately about how heroic the leaders of the nationalist movement are and must be, not only to have the bravery to start, but to survive psychologically year after year. My hats off to JT and all the rest. I mean that from the bottom of my heart. What Taylor and American Renaissance do is take single stories and show how they figure into the bigger picture of race. This is so whether it is crime, immigration, education, terrorism, politics, whatever. It’s very effective agitprop, getting the reader to think in racial terms. From there, all else follows. If there was ever the case for a modern day Stoic sage, Taylor would be it. I’ve met Jared several times and always felt like I was in he presence of someone almost unaware of their own excellence. A humble regalness. I used to be impatient with his stance on certain questions, but accept that he probably knows better than I do how he can best help our people. I only recently came across Jared Taylor when his infamous “Race Differences in Intelligence” presentation was placed in quarantine by YouTube. Since then I’ve been a regular visitor to his site American Renaissance and have read two of his books. The Streisand Effect in operation ! Jared Taylor indeed is a wonderful model for leaders or potential leaders in the Alt-Right or White nationalist movement. I have greatly benefited from his example, his speeches, and his outstanding website ‘American Renaissance.’ Although I differ with him on the ‘Jewish Question’ (lately, he seems to be a little more conscious of it and less restrictive of those who voice contrary opinions on his website which is a good thing), he always treats everyone with respect and dignity. Depending on how things progress, however, it may be that changing social conditions might require different kinds of leaders in our movement, perhaps men who are more militant and forceful? That may be an awkward of expressing it, but I hope the reader will see my point. Being a genial and subdued public figure may work at this point, but what kind of leaders will arise once Bolshevik radicals and their governmental enablers begin to arrest, openly persecute and murder our people? Politeness and congeniality will only do so much, and such qualities will do little to prevent enraged Antifa fanatics from seriously injuring or killing you. I tend to think that as circumstances change for us and our movement, new leaders will emerge that will take on a different ethos and strategy than Taylor. This is often how new social and ideological movements transition with leaders, and it’s at least something we ought to consider and be prepared for. We need BOTH our Jared Taylor types as well as other leadership styles that will provide form and progress for our movement. After all, we are fighting for our racial survival. When it comes time to list the most courageous men of these times, Taylor will rank among the top one. while I love taylor, other people have said provocative things about race when they have stood much to lose, Herrnstein and Murray, for example, and faced louder outcries, but the only sort of activism that might put one in a lower circle of hell than Kevin macdonalds might be holocaust denial, which is actually jailable in some countries. Even if one disagrees vehemently with these deniers, one has to allow them the amoral virtue of courage, correct? The very existence of Jared Taylor is a bloody miracle. An excellent post! I greatly admire Mr. Taylor’s writing and advocacy, although I have never met him or attended a function where Mr. Taylor was present. It was through the writings of people like Mr. Taylor as well as San Francis and Joseph Sobran that I became acquainted with “alt-right” and paleo-conservative ideas. Thank you for this piece. Thank you. If you met him you would like him tremendously. Everyone does (except Leftists). I have thought about the need for an article or a video titled, “Why Jared Taylor is the man most feared by the Left – or should be”. Thanks to Jef Costello – Mission Accomplished. Well said. I couldn’t agree more. His demonstrated commitment, tireless efforts, and overall gentlemanliness are a source of inspiration. That Twitter would ban him first tells us that his approach scares them more than other, more LARPy approaches. Back in the day, I used to set my VCR to record his regular appearances on Phil Donahue’s old MSNBC show, where the two would joust, Jared always remaining cool, on-point, and effective. Imagine, for a moment, if we could have sober WN voices like his on mainstream cable news shows today… imagine the reach it would have in today’s climate. Yes. Good point about Twitter! Jared is very “dangerous” in the eyes of our enemies, because he is rational and persuasive.